Compete with fellow industry Titans to conquer the land, build factories, and collect resources all in the name of manufacturing the latest and greatest technological gadgets. Titans can build factories to mine land for Wood, Oil, Silicon, or Alloy. These resources can be used to create more factories or invested in technology worth valuable Victory Points. But watch out — land is precious and can easily be lost to over-harvesting or natural disaster. The game ends when a Titan has collected 15 Victory Points or players can no longer advance gameplay (e.g. all land tiles have been removed). While the first player sets up the board, have another player place 10 push-pin “Trees” into each tile. Separate the resources into individual piles. Place these piles face-up on the table. Lay the first four cards from the Technology pile face up next to the deck which is faced down. Do not shuffle this deck. Shuffle the Natural Disaster pile and place it face-down. Provide each player with a cheat sheet. Have each player choose a card from the Natural Disaster pile. The player with the highest number goes first, placing one factory in the center of any tile of their choice (excluding barren, unmineable tiles). Continuing counter-clockwise around the table, each subsequent player does the same. Once the last player has placed his factory, he places a second factory on the center of any tile adjacent to his first factory. Play then reverses order. Continue in this fashion (clockwise) until every player has placed two factories. Return the Natural Disaster cards to the deck and shuffle. The player who pulled the highest number in the first phase goes first. A player can choose to skip any and all of the phases if they choose but each phase must occur in the order provided above. A round consists of all players taking one turn. At the end of a round draw the appropriate number of Natural Disaster cards (see Natural Disasters). Each turn, players may mine their tiles for resources and/or plant trees on those tiles that have not been mined. Tiles that are mined in a turn may not have trees planted on them in that same turn. Players may mine as many of their tiles in a turn as they choose. Each tile may be mined as many times as the resources allow (i.e. until no trees remain on a tile). If all trees are removed from a tile, the land is exhausted and dies. This tile is then removed from the board, along with any factory located there. This factory is not returned to the player. Trees can be placed on tiles that 1) are currently owned by the player and 2) have not been mined this turn. Each turn, the player may choose to plant a number of trees equal to the number of tiles the player owns. For instance, a player with three factories in play may plant three trees, regardless of how many tiles they have mined this turn. Multiple trees may be planted on the same tile. The number of trees on a tile cannot exceed the maximum tree allotment (see Planet Health). Players may trade resources with each other or with the bank. Resources are traded with the bank according to their tree value (as described in the mining table above). E.g. one alloy may be traded for four wood, two wood and one oil, or one silicon and one wood. Players may trade resources among themselves in whatever way they choose. Each building action costs one point to Planet Health (see Planet Health). After each building action, reduce the Planet Health slider by one point. New factories may be built on a tile adjacent to a current factory at-cost. To build a factory on a tile not adjacent to a current factory, add 1 Wood to the cost of construction. Upgraded factories can mine a resource for one less than the original tree value of the resource. (For Wood the cost does not go to zero trees but the player receive two wood for one tree). To upgrade a factory, remove two trees from the land and replace the single-story factory piece with the two-story factory piece and return the single-story factory piece to your hand. This piece can be placed back into play by building a new factory. Barren tiles can be made mineable by paying the above cost. This cost includes the new factory. Only tiles adjacent to a player’s current factory can be made mine-able. The player designates which resource to convert the tile to by marking the tile with that resource card. Place the resource card on top of the barren tile. At the end of a turn, the player may choose to purchase a Technology card. The cost of each Technology is listed on the card along with its associated Victory Point value. Once a Technology card is removed from play, replace it with the next card in the deck. The planet health decreases one point for each factory, upgrade, or tile made mineable. 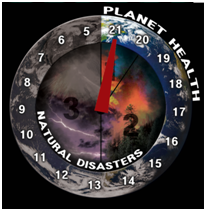 To adjust the planet health level, drag the paper clip to the appropriate level on the Planet Health slider, starting from 21 and counting downward. This corresponds to the maximum tree allotment per tile. The number of trees on any given space cannot exceed this number — i.e. trees in excess of this number must be removed from a tile before play can proceed. Planet Health affects all tiles in the game, including those that are not currently populated. Planet Health also affects the number of Natural Disaster card played per round (see Natural Disasters). Natural disasters affect the tile number indicated on the card, even if this tile is not populated by any player. Three trees are removed from the affected tile. If the tile has three or fewer trees on it at the time of the disaster, the land is exhausted and dies. This tile is then removed from the board, along with any factories located there. This factory is not returned to the player. Remove the cards from the deck and shuffle. The game ends when one player collects 15 Victory Points or all of the land is exhausted. When the game concludes, each player receives one point for each of the (non-exhausted) tiles still in their possession. The player with the most victory points wins.